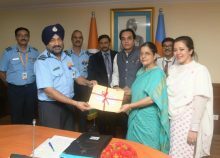 India Tourism Development Corporation (ITDC) has bagged Indian Air Force’s (IAF) ‘SPEEDEX’ (The Stores, Proactive, Efficient and Expeditious Despatch of Extra Size/ Wt Consignment) Cargo contract for ‘Surface Transportation’ of consignment weighing above 35 kgs for ‘door-to-door delivery’. The service launch and agreement was signed in the presence of Air Marshal RKS Shera, AVSM VSM, Air Officer- in-charge Maintenance and Ravneet Kaur, IAS, CMD, ITDC; Piyush Tiwari, Director (C&M), ITDC, along with senior officials of both the organisation at the Air Force Headquarters (Vayu Bhawan), New Delhi. According to the contract, ITDC’s travel arm, Ashok Travels and Tours, will ensure safe, reliable and secure movement of the Indian Air Force Surface cargo. The scope includes handling the consignments (collection and delivery) between IAF units located all over India. There are over 130 stations spread across the country. It will enhance support to Indian Air Force maintenance activities and improve operational preparedness, in the long run. Ashok Travels and Tours has been actively involved in cargo handling through surface, air as well as sea. In the recent times, ATT has handled several cargo consignments for defence forces.